1. For the salad cream, put the mustard and egg yolk in the small bowl of a food processor with a pinch of salt. Start the motor and slowly pour in the vegetable oil; the mixture will emulsify and thicken as you pour. Next add the evaporated milk, then the olive oil and vinegar; it should form a thick, creamy consistency. Season with the sugar, plus salt and ground white pepper to taste. 2. For the salad, bring a large pan of water to the boil, then add the eggs. Cook for 6-7 minutes, then lift out and plunge into iced water to stop the cooking. Peel and cut into quarters. 3. Remove any shrivelled outer layers from the lettuce and cut the heads into quarters lengthways. Remove the hard outer rind of the gruyère, then cut into fine 6cm sticks. 4. 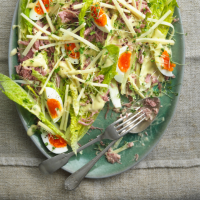 Arrange the lettuce on a platter, then flake the ham over the top and scatter over the eggs. Season and dress with generous amounts of salad cream, scattering the cheese and cress on top.